University of Jammu LLM Admission 2019 - University of Jammu (JU), Jammu invites applications from eligible and interested candidates for admission to two-years Master of Law (LL.M) Course offered in the Department of Law through entrance test for the academic year 2019-20. 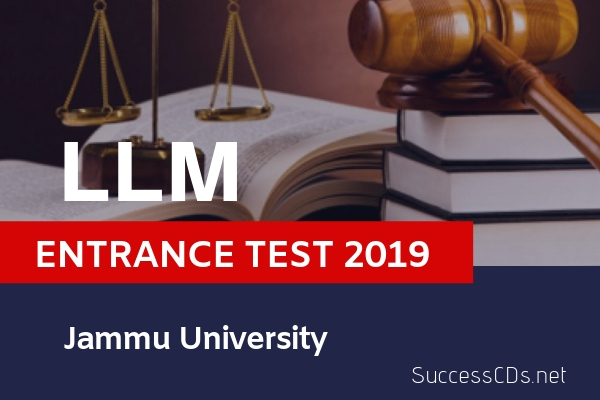 Candidates who want to pursue their education in the field of law from Jammu university need to appear in the entrance test organized by the university itself. LLM Entrance Test will be conducted by the Dept. of Law, Jammu University. Candidates having 55% marks or more (50% in case of SC/ST candidates) in LLB (professional) 3 year/5 years course are eligible to apply. Selection will be based on entrance test to be conducted by the Department of Law, University of Jammu. The candidates shall have to appear in the Entrance Test to be conducted by the Department of Law on 31st January 2019. The application form, syllabi, modalities and other requirements of the Entrance Test can be obtained from the office of the undersigned w.e.f. 31st January 2019 to 20th February 2019 @ Rs.500/-)/- without late fee and upto 22nd February 2019 with a late fee of Rs.200/-; the date for submission of duly completed forms is 25th February 2019.